Happy Skin is a skincare brand that is designed to empower women to take care of themselves physically and mentally. Caring for your skin will translate into the woman feeling happy and confident in her own skin. The logo is a nod to the iconic smiley face symbol. The scripted typeface gives a personal touch to the packaging while the sans serif typeface creates boldness. 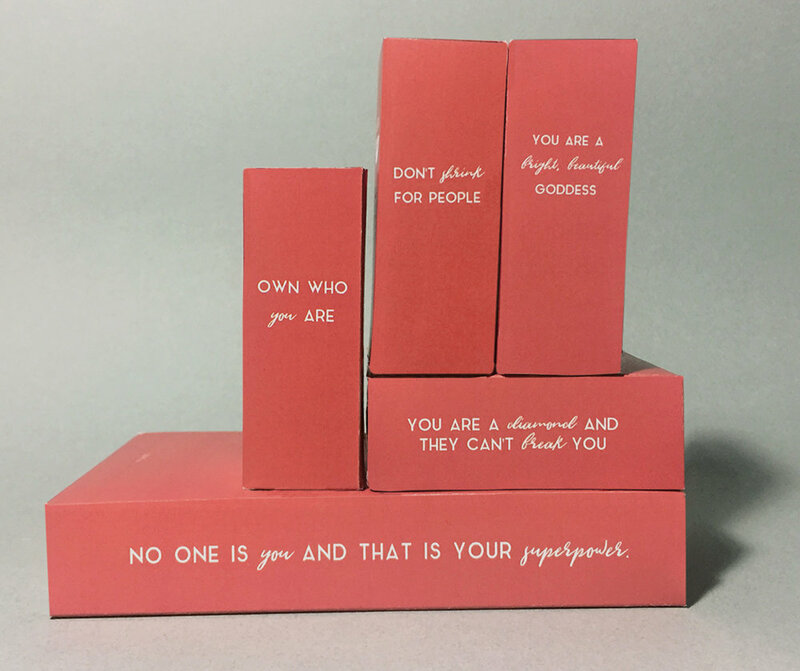 With self-loving quotes featured on the packaging, the women who use the products will begin to use those quotes for “pick me ups” when they need them. The drawer box design makes to not only to display the product boxes beautifully but also be used as a beautiful keepsake drawer when the products are all gone. After the products are all used up and gone, the buyer can use the box for storage. The design concepts and/or illustrations featured on this portfolio website are property of Jasmine M. Miller. These designs and concepts may not be copied, duplicated, reproduced, or used in part or in whole without the written permission of Jasmine M. Miller.